Haslett Farm has given us mixed results in the past, our first outing in 2015 was in a field that turned to mush when it rained and the second field in 2016 was a fast flat dust bowl. This inconsistency may have contributed to the low numbers of competitors that turned out for round 8. However, the 16 drivers that did turn up were treated to an amazing venue that had some of the most extreme elevation changes ever seen. From the start line the course twisted its way up the stubble field in what one competitor (Dan Morgan) described as an off road version of Eau Rouge from Spa. On top of this scenic plateau, drivers had to navigate a challenging series of loops and tight turns before a slow technical twisty section as they descended to the finish box. But it was in round 2 that Chris Wilson showed everyone why he is so dominant at USS events this year by posting a time teetering on breaking the 1 minute barrier by .8 of a second. With no drivers in class 1, the battle of the unmodified cars was between Barry Richardson in his MX5 and Josh Finch in his MGF, with the latter winning the honour of fastest class 2 car at the day’s close. Class 3 consisted of Chris Lee who returned with his daughter Lorna Lee, Marion Brett who was presented with the flowers for being the fastest lady of the day and Steve Brett who only performed one correct test during the entire day but his single correct run was quick enough to place him in 4th overall, just missing out on the podium. Class 4 is for modified cars over 1400cc. Sue Mitchell and Steve Glass were campaigning their Toyota Corrola and almost did not make the start line as Steve managed to drive into a hole on his way to scrutineering, luckily with no damage done. John Cooper and Wayne Hole were driving their Autocross prepared Ford Focus but had no answer for Dan Morgan in his Subaru. Class 5 is for cars that do not fit into any of the other classes. Kevin Richardson was driving his ex Autograss mini but suffered mechanical issues and chose to drive his father’s MX5 for the second half of the day and the remaining class 5 cars were the single seater specials of Andy Williams and Chris Wilson. 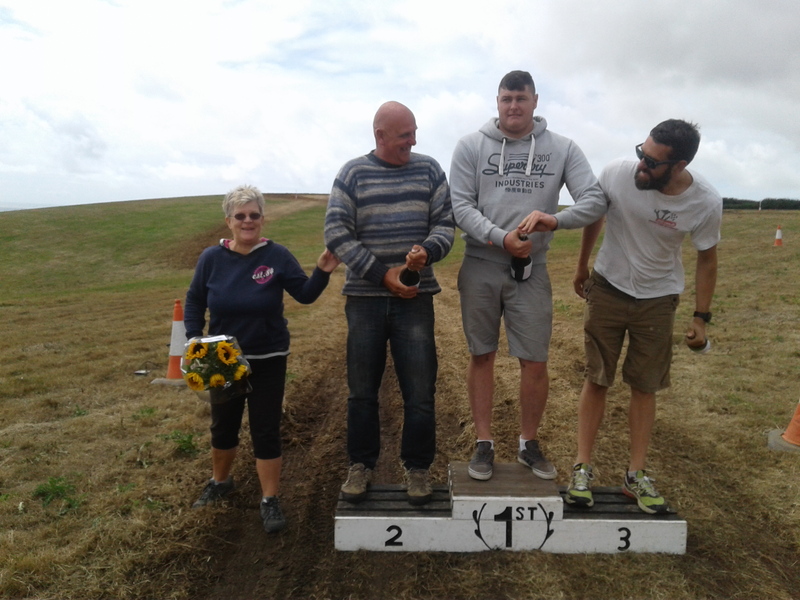 With a successful event and big championship points for those that attended it was Dan Morgan who claimed the 3rd step of the podium and Andy Williams who stood on the second step. However, Chris Wilson did break that 1 minute barrier in round 4 with a blistering time of 0:58.14 and with no other driver anywhere close to this time he did not compete in rounds 4 and 5 and won the event with a 3 and a half second lead. 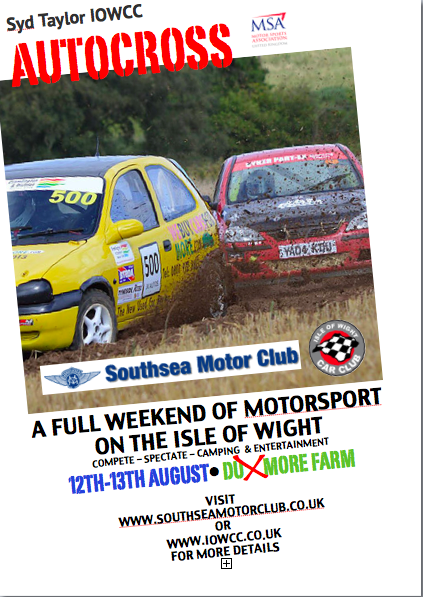 The next round is a Sealed Surface event on the 3rd of September at the Isle of Wight College. 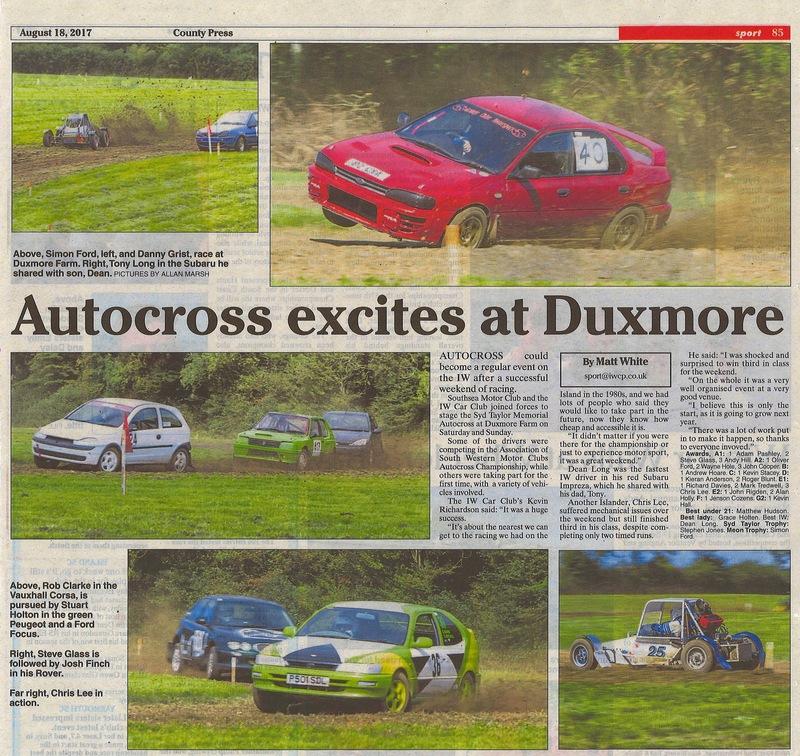 However, there is a lot of excitement with regards the Syd Taylor IOWCC Autocross on the 12th and 13th of August. More details can be found on our web site.